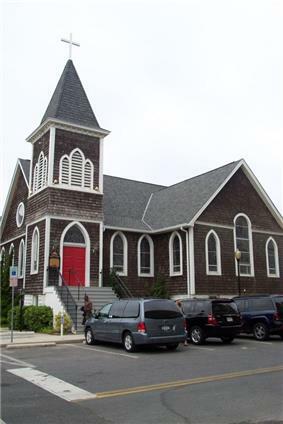 Carpenter Gothic, also sometimes called Carpenter's Gothic, and Rural Gothic, is a North American architectural style-designation for an application of Gothic Revival architectural detailing and picturesque massing applied to wooden structures built by house-carpenters. 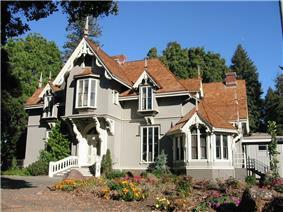 The abundance of North American timber and the carpenter-built vernacular architectures based upon it made a picturesque improvisation upon Gothic a natural evolution. 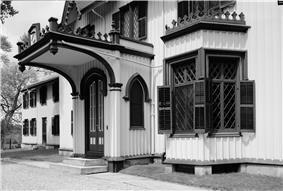 Carpenter Gothic improvises upon features that were carved in stone in authentic Gothic architecture, whether original or in more scholarly revival styles; however, in the absence of the restraining influence of genuine Gothic structures, the style was freed to improvise and emphasize charm and quaintness rather than fidelity to received models. The genre received its impetus from the publication by Alexander Jackson Davis, Rural Residences and from detailed plans and elevations in publications by Andrew Jackson Downing. 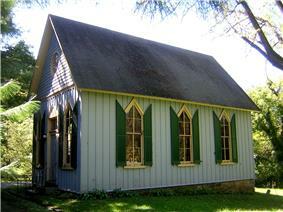 Carpenter Gothic houses and small churches became common in North America in the late nineteenth century. 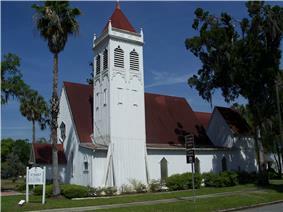 These structures adapted Gothic elements such as pointed arches, steep gables, and towers to traditional American light-frame construction. The invention of the scroll saw and mass-produced wood moldings allowed a few of these structures to mimic the florid fenestration of the High Gothic. 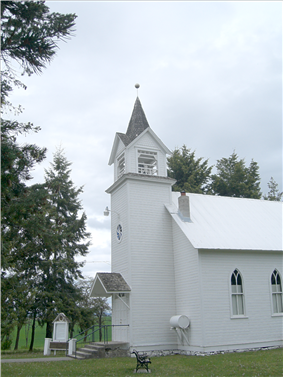 But in most cases, Carpenter Gothic buildings were relatively unadorned, retaining only the basic elements of pointed-arch windows and steep gables. Probably the best known example of Carpenter Gothic is the house in Eldon, Iowa, that Grant Wood used for the background of his famous painting American Gothic. 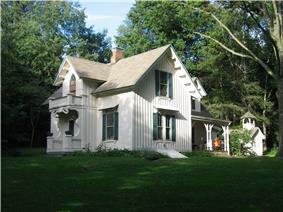 Carpenter Gothic is largely confined to small domestic buildings and outbuildings and small churches. It is characterized by its profusion of jig-sawn details, whose craftsmen-designers were freed to experiment with elaborate forms by the invention of the steam-powered scroll saw. A common but not necessary feature is board and batten siding. 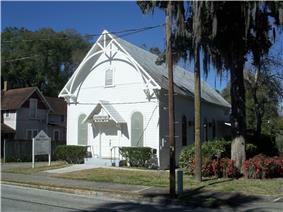 A less common feature is buttressing, especially on churches and larger houses. 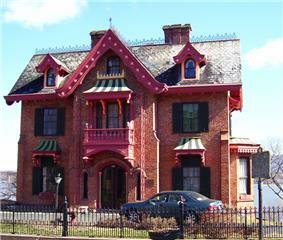 Carpenter Gothic ornamentation is not limited to use on wooden structures but has been used successfully on other structures especially Gothic Revival brick houses such as the Warren House in a historic district in Newburgh, New York, which is said to epitomize the work of Andrew Jackson Downing, but was actually done by his one-time partner, Calvert Vaux. 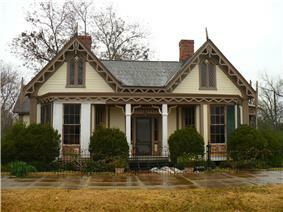 Carpenter Gothic structures are typically found in most states of the United States, except Arizona and New Mexico. 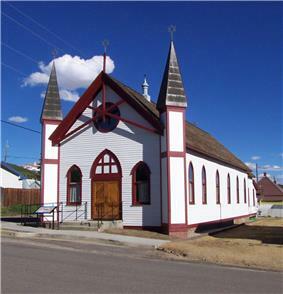 Many Carpenter Gothic houses were built in Nevada in the 1860-1870s (Virginia City, Reno, Carson City, and Carson Valley areas) and still exist (2010). 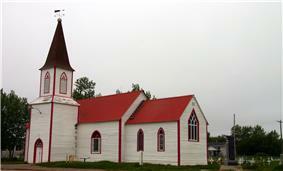 In Canada, carpenter Gothic places of worship are found in all provinces and the Northwest Territories, while Carpenter Gothic houses seem to be limited to Ontario, Quebec and the Maritime Provinces. 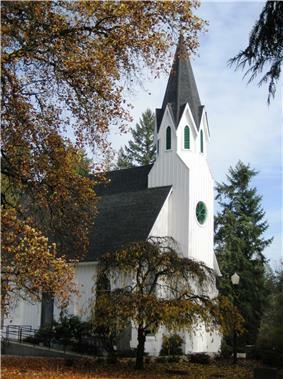 Many American Carpenter Gothic structures are listed on the National Register of Historic Places, which may help to ensure their preservation. Many, though, are not listed and those in urban areas are endangered by the increased value of the land they occupy. 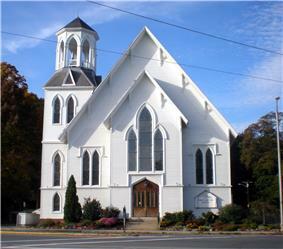 A current example of this is St. Saviour's Episcopal Church, Maspeth, New York, built in 1847 by Richard Upjohn. It was sold to a developer in 2006. Its rectory had already been demolished and a deal with the City of New York to preserve the church in exchange for higher density on the remaining vacant land fell through and the parcel went on the market for $10 million. 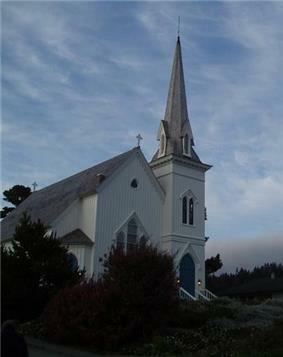 After a number of postponements, in March 2008, just hours before the final deadline to demolish the church, a deal was struck with a local community group, whereby they were allowed time to raise money to move the structure. At a cost of some $2 million, the building was reduced to its original appearance and dismantled into pieces, so it could be transported through the narrow, winding streets of the neighborhood. It was reconstructed on the grounds of a cemetery in the nearby neighborhood of Middle Village, where it is now used for community activities. 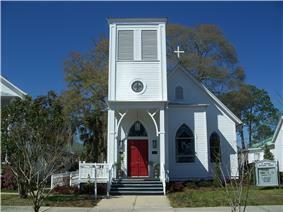 Some Carpenter Gothic buildings have been relocated for reasons ranging from historic preservation to aesthetics. 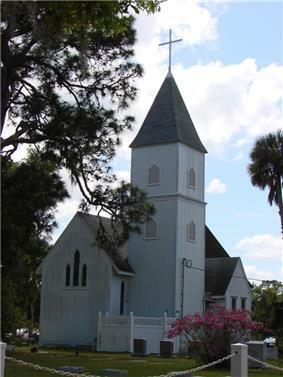 Some, such as All Saints, Jensen Beach, Florida, have been moved only a few hundred feet on the same property in order to get a better view and to allow for expansion, while others such as Holy Apostles, Satellite Beach, Florida, have been barged many miles in order to be preserved. 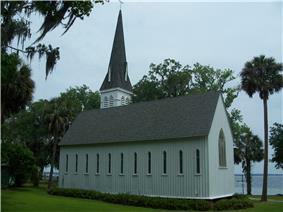 Others such as All Saints, DeQuicy, Louisiana, have been dismantled, transported long distances and then reassembled in order to be preserved and reused. Some structures have been moved many times. 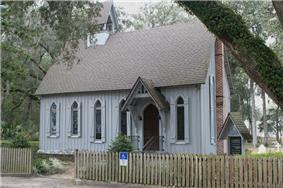 St. Luke's, Cahaba, Alabama, has had an interesting history of moves. 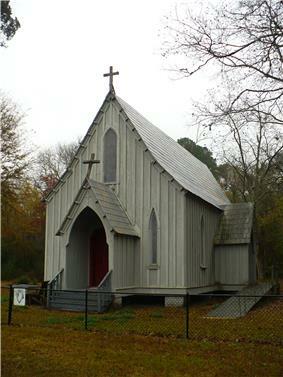 In 1876, due to the danger of flooding in Cahaba, it was dismantled and moved from its original location 25 miles or so to Browns where it was reassembled. 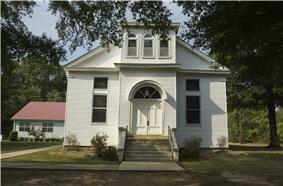 In 2006–2007, it was carefully dismantled by students from Auburn University and moved back to Cahaba, where it is now being reassembled by the students on the Cahaba State Historic Site not too far from its original location. 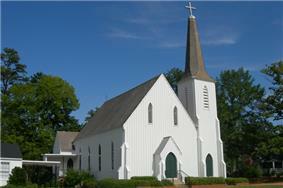 Some Carpenter Gothic structures such as St. Stephen's in Ridgeway, South Carolina, have had their exteriors altered by stuccoing, brick veneering, etc., so that their original style is no longer apparent. 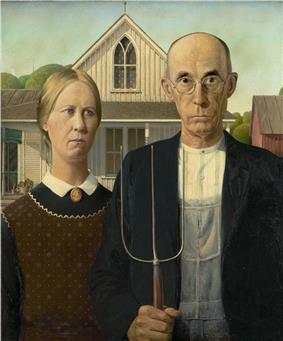 "American Gothic" is a painting by Grant Wood from 1930. Wood's inspiration came from a cottage designed in the Carpenter Gothic style with a distinctive upper window and a decision to paint the house along with "the kind of people I fancied should live in that house." 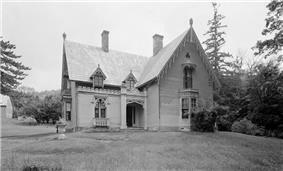 Steamboat Gothic architecture, a term popularized by Frances Parkinson Keyes's novel of that name, is sometimes confused with Carpenter Gothic architecture, but Steamboat Gothic usually refers to large houses in the Mississippi and Ohio river valleys that were designed to resemble the steamboats on those rivers. 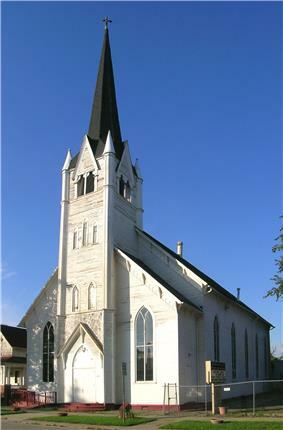 Carpenter Gothic structures are still being built today. ^ The British denigration of Sir Ely Cathedral as "Carpenter's Gothic" are discussed in Phillip Lindley, "'Carpenter's Gothic' and Gothic Carpentry: Contrasting Attitudes to the Restoration of the Octagon and Removals of the Choir at Ely Cathedral" Architectural History 30 (1987:83-112). 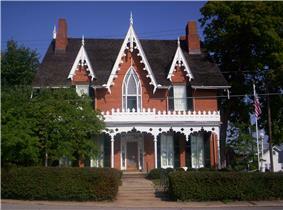 ^ a b "Ontario Architecture:Carpenter's Gothic"
^ Angelos, James (April 6, 2008). 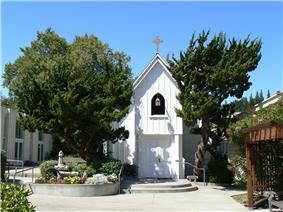 "For a Church Bathed in History, a Last-Minute Miracle". The New York Times. Retrieved 12 March 2013. ^ "Grant Wood", Art Institute of Chicago. Retrieved December 14, 2008. 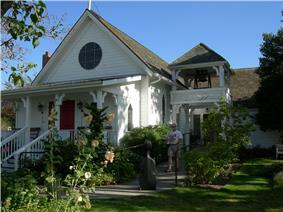 Wedding Cake House (Kennebunkport, Maine). 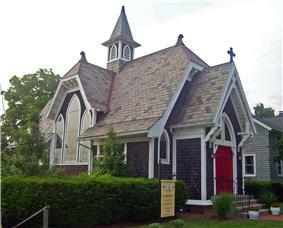 Called the "most photographed building in Maine," it is an example of Carpenter Gothic remodeling of a frame building originally built in another style of architecture. Harmony School, School District No. 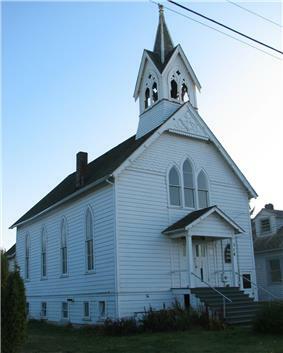 53 in rural Otoe County, Nebraska is an example of a Carpenter Gothic one-room schoolhouse. 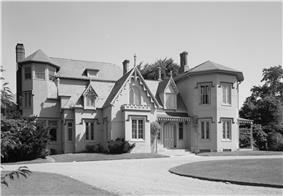 Kingscote in Newport, Rhode Island, built in 1839. Afton Villa, a former plantation house in West Feliciana Parish, Louisiana. 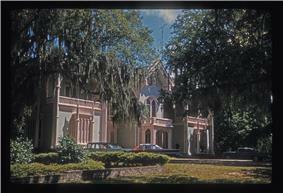 Built from 1848–56, the masonry structure burned in 1963. 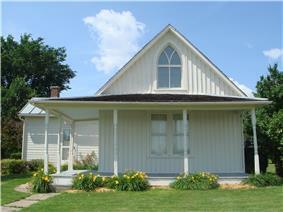 American Gothic House in Eldon, Iowa, used by Grant Wood in his famous painting. 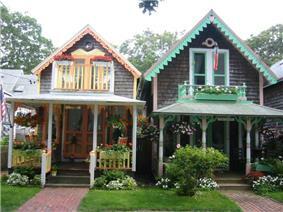 Cottages in a former Methodist camp town in Oak Bluffs, Massachusetts on Martha's Vineyard. 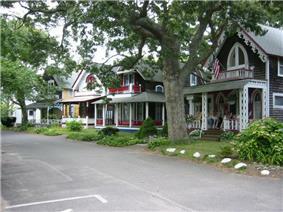 Another view of cottages in Oak Bluffs,. 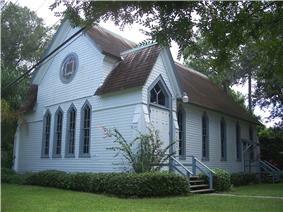 St. Andrew's Episcopal Church, Prairieville, Alabama Note the buttresses. 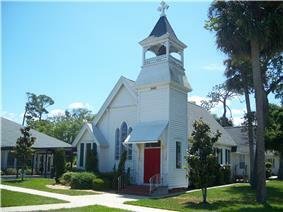 St. Mark's Episcopal Church (Palatka, Florida). Note the buttresses at the base of the belfry. 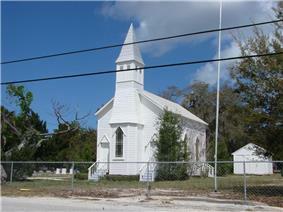 United Hebrews of Ocala (Florida), synagogue, now Ocala Bible Chapel. 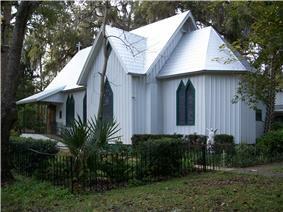 St. Margaret's Episcopal Church (Hibernia, Florida). 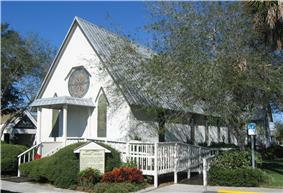 St. Agatha's Episcopal Church, DeFuniak Springs, Florida. Note the unusual tower. Temple Israel, Leadville, Colorado, 1884 Reform synagogue. 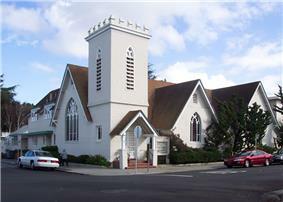 Many nineteenth-century timber Gothic Revival structures were built in Australia, and in New Zealand - such as Frederick Thatcher's Old St. Paul's, Wellington, and Benjamin Mountfort's St Mary's, but the term "Carpenter's Gothic" is not often used, and many of their architects also built in stone. 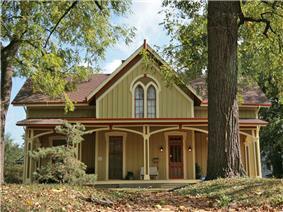 while Carpenter Gothic house plans are available.